If your idea of a perfect Cuban holiday is great food, friendly people & relaxing days on a breathtakingly beautiful beach, you should consider staying at the beach resort Hotel Playa Paraiso. Hotel Playa Paraiso is a new, modern complex that is attractive inside & out. It is well designed, comfortable & spacious, though easy to get around for guests of all ages. Being a new resort, there may be minor problems from time to time but the staff are very attentive & readily resolve them, allowing guests to enjoy what this resort is all about: relaxation. From the poolside loungers to the massage facilities at the picture postcard beach, you will find plenty of opportunity to unwind. Playa Paraiso hotel has 4 pools (2 for children), a spa, gym, tennis & children’s club; while you can also explore the wider area by horse or bicycle. There are regular activities organised around the pool & beach, or you can learn scuba diving & explore the reefs visible from the shore. Other beach sports include sailing, water bikes & catamarans. However, most guests enjoy simply walking the long stretch of soft white sand & wading through the calm, turquoise waters. Food & drink at Playa Paraiso Hotel are excellent with a buffet restaurant, beach grill & 3 a la carte restaurants (Mediterranean, Italian & Cuban). The service & quality of food is very good in each & there are new dishes to try every day. 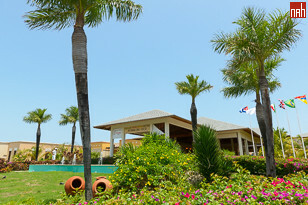 Cayo Coco hotel has 4 bars, including a beach bar & poolside bar, which serve refreshing cocktails. There is also good evening entertainment with live shows & music. Whether you are travelling in a couple, family or larger group, Hotel Playa Paraiso is the perfect choice for a relaxing break, particularly if a beautiful beach & great food are high on your list. 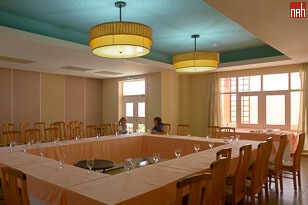 Hotel Gaviota Playa Paraiso was managed by the Portuguese company Pestana and it was known as Hotel Pestana Cayo Coco. If you want that little bit of extra luxury, upgrade to one of the resort’s 20 suites. In addition to the facilities in the junior suite, you will have almost double the space, a walk-in shower & jacuzzi bath. 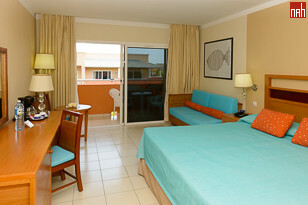 The junior suites at Hotel Pestana Cayo Coco are colourful, spacious & very comfortable with modern fittings. The junior suites are kept spotlessly clean by friendly maids who leave decorative towel sculptures. They have modern bathrooms & facilities which include air conditioning, safe, mini bar, satellite TV & a balcony. 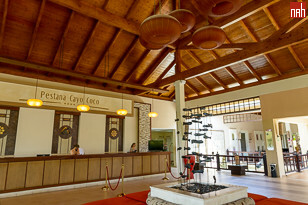 Cayo Coco Beach Resort has no lifts so less mobile guests should request accommodation at ground floor level.